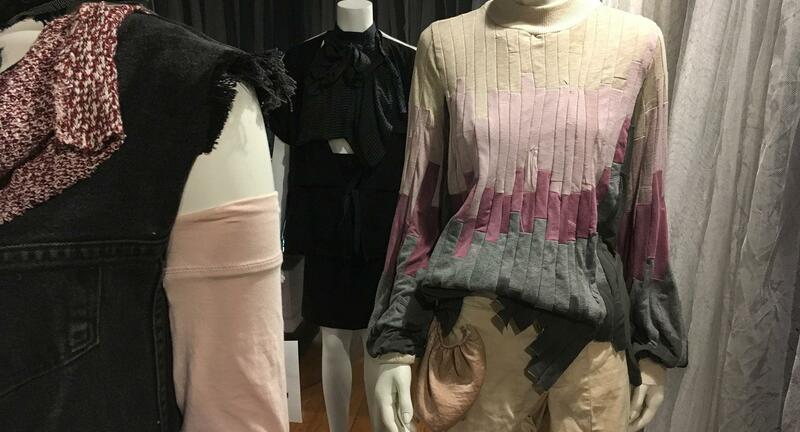 A new exhibit in Gearing Hall showcases a fresh, sustainable take on fashion that started with an unusual choice: undergraduate fashion design students pick material from a pile of discarded garments. The result is innovative and thought-provoking display of ten activewear designs, including beautifully tailored cream shorts, a multihued shirt constructed with strips of cloth, and an elaborate quilted cat peeking from the back of a jacket. "We started this project with the students taking apart discarded clothing and reconstructing it into new designs," says Jessica Ciarla, a lecturer in the Division of Textiles and Apparel at The University of Texas at Austin. "We are teaching the students how to address zero waste in the world of fast, disposable fashion." This exhibit grew out of a new initiative recently launched by Ciarla and other merchandising and/or design faculty members Peggy Blum and Gail Chovan called The Circle Project. Circularity in fashion and business aims to keeps products and materials in use for as long as possible to achieve their maximum value, and The Circle Project includes circular fashion methods into the undergraduate curriculum. This way, students have a creative avenue to experiment with sustainability and explore new production processes and technology to decrease the impact of fast fashion. This is a chance to take post-purchase apparel and put it back into the beginning of the supply chain through education," says Blum. "It is important to raise awareness about sustainability among the next generation of fashion designers and retailers." The new curriculum developed under The Circle Project is multi-pronged. First, merchandising students taking Consumer Behavior and Research Methods courses collected 1500 pieces of clothing and analyzed fast fashion consumer behaviors, manufacturing, and textile properties. Next, a draping course taught by Chovan and Ciarla challenged design students to select 10 pieces of clothing from the collected pile and reconstruct them into 29 new sustainable garments. All of these activewear designs can be viewed during this year's fashion show, Dimension. "We are excited to include a new element into our annual fashion show," says Chovan. "This exhibit is essentially a preview of what will walk down the runway in April at the Frank Erwin Center."